Low Fat Pasta Salad Servings: 8 From refrigerator to table in 30 minutes. In a Snap! Low Fat Pasta Salad is a recipe designed to be prepared in 30 minutes or less. This is a great last minute low fat recipe. It is one of those marvelous dishes you can throw together when you have unexpected guests. In a Snap! Low Fat Pasta Salad is the perfect dish to bring to any potluck, BBQ or tailgate party. This recipe can be doubled to make twice as many servings and easily adapted to suit vegetarian and gluten free diets. To make In a Snap! Low Fat Pasta Salad gluten free, use gluten free pasta. Typical gluten free noodles contain quinoa, rice or corn instead of wheat flour. In a Snap! 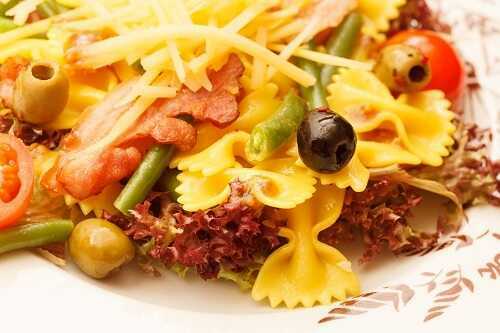 Low Fat Pasta Salad can be assembled using a variety of ingredients. To make this salad your own choose one or more of the optional ingredients. If you’re a making this dish last minute, get creative and dig through your cupboard for your own ingredients. Take out a bowl large enough to hold all the ingredients. Prepare the pasta as directed on the bag in a large spaghetti pot. Cook the pasta for the least amount of recommend time (if the bag recommends 6-8 minutes, cook for 6 minutes). Drain the pasta in a colander and rinse it thoroughly in cold water for several minutes. To the well drained pasta add the salad dressing and toss thoroughly, coating the pasta with the dressing. Add any optional ingredients and toss lightly. In a Snap! Low Fat Pasta Salad can be served warm or chilled. Enjoy!